User-friendly search functions make The Norwegian Agency for Development Cooperation website worth visiting. 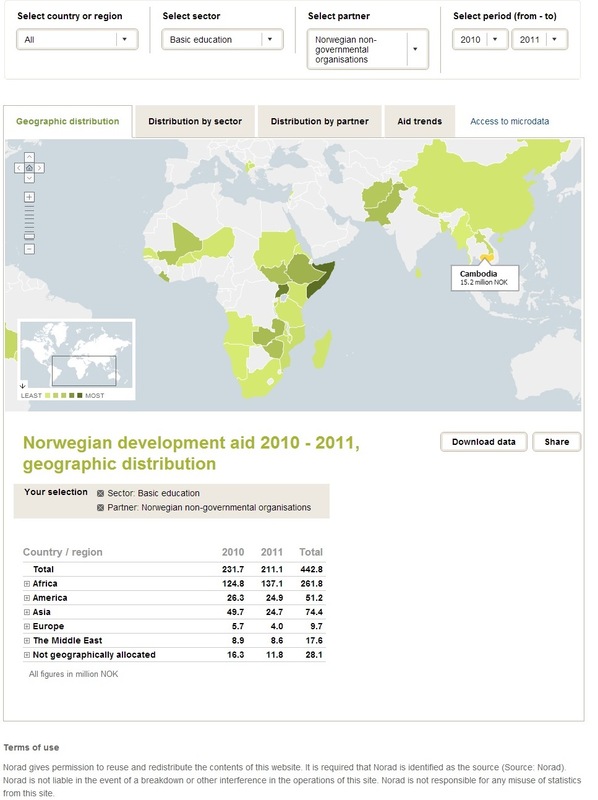 The interactive Norwegian Aid Statistics section of the website provides some interesting and attractively presented information on the geographic distribution of Norwegian aid, by sector and mechanism, and the user-friendly search function for Norad documents makes it relatively easy to find handbooks, evaluations and reports on specific sectors, and countries. Among the 9 documents on quality assurance, however, there is only one, from 1999, which provides any hands-on guidance to the practical steps in defining problems and results. The Aid statistics section of the Norad website is of interest to anyone who wants to see how an aid agency distributes its assistance by country, sector and mechanism, and the easy to access reports and evaluations could be of use to planners and evaluators who want to know how the agencies Norad funds operate. 8 of the 9 guides on quality assurance, results based management and planning, intended primarily for Norwegian embassy, Norad, and Foreign Affairs staff, are, however, too broad to be of use to project field managers or their partners, who might be looking for practical tips on results based management. But some of these documents could be of use as an explanation of general Norad policies on results and sustainability, for partners from other donor agencies, or for implementing agencies, to understand what Norad expects in terms of plans and reports, if it provides funding. The oldest document, a 1999 handbook on the Logical Framework Approach is, however, moderately useful for those who have to work their way through the trenches of results definition and indicator selection. In 2010 I reviewed the donor agency RBM frameworks and guides provided by SIDA, AusAid, Danida, USAID, DFID, CIDA, Europeaid and some UN agencies. Recently a colleague, interested in the professional opportunities presented by recent development projects funded by the Norwegian aid agency, asked me what I knew about Norad’s results based management. This is interesting, because while some aid agencies such as CIDA appear to have been cutting back on new projects, and requests for consulting services, a brief scan of the Devex database on tenders shows that in the past year (December 2011-December 2012) there were 38 tenders, for project implementation, individual evaluations or other work issued by NORAD, almost as many as for USAID, and far exceeding other major donors such as AusAid and CIDA. And while it might be argued that agencies such as AusAid and CIDA use other mechanisms for recruitment, (although in CIDA’s case that too has been declining) there is no doubt that Norad is a significant factor in international development, and obviously one of interest to development partners and implementing agencies. Despite its very real presence in international development the acronym for the Norwegian aid agency’s name, does it no favours in internet search. Simply searching for “Norad” on the web won’t provide much usable data. 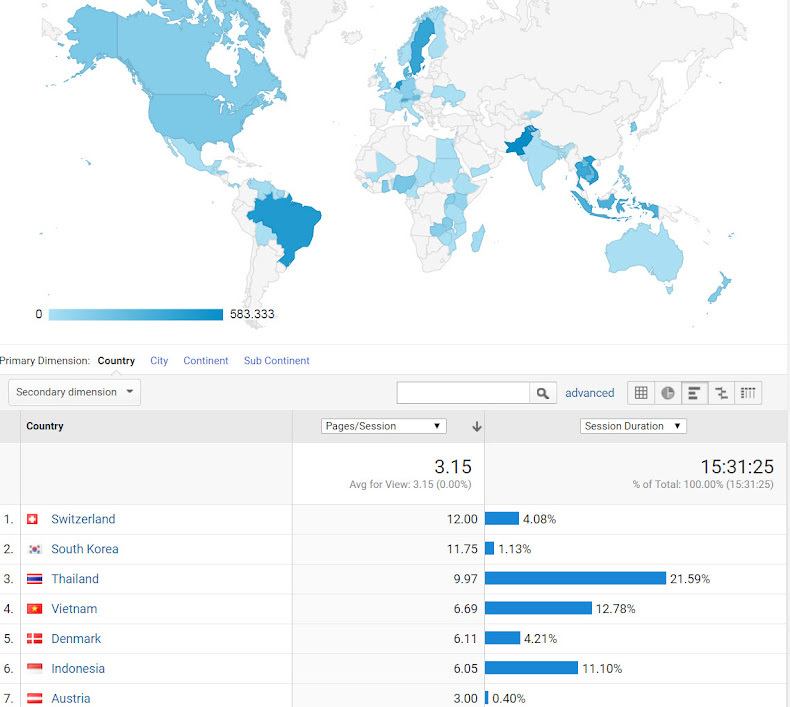 On Google, for example, a recent search showed the first 4 pages, or 45 hits referring primarily to the North American Air Defence Command, Santa Claus and a few bars, but number 46, for readers who go in that far, will indeed take us to the Norwegian Agency for Development Cooperation. Clicking on “Tools and Publications" on the Norad home page gives us three choices. There are 9 documents listed here. 6 of these deal with administrative and funding arrangements. The website quite clearly says these were produced primarily for Norway’s embassy staff, staff of Norad, and the Ministry of Foreign Affairs – and that some might be of use to partners. To the extent that implementing agencies (NGO’s or private companies, and local partners) want to know what Norad expects in terms of RBM and quality assurance, it would be worthwhile to read at least two of these documents. And staff of other aid agencies, which may be working in coordination with Norad, can find in these some general background on its approach. 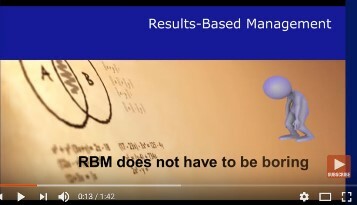 But there is only one, the oldest of the lot, which provides any practical guidance on RBM. The 36-page Results Management in Norwegian Development Cooperation : A practical guide, produced in 2008 is, despite the name, less a hands-on practical guide of the kind produced by, for example, the University of Wolverhampton, or those listed by the UN on its websites, and more a summary of the broad strokes of how the development community conceives of results chains, risk, and monitoring, with references to (and diagrams from) documents such as those produced by OECD, Kusyk and Rist’s much more detailed Ten Steps to A Results Based Monitoring and Evaluation System, Unicef Egypt’s Toolkit on Evaluation and others. For those who want to get into the details of how to actually define results, select workable indicators, report or evaluate effectively, those original documents are more useful. But if you want to know what Norad expected of implementing agencies then this 2008 document might be useful. Of more immediate use as a practical handbook for those trying to work their way through the RBM issues during project inception, is, in my opinion the 103 page The Logical Framework Approach (LFA): Handbook for Objectives-Oriented Planning, published in 1999, which gets into the details of how to run a workshop to bring participants together to define problems, explore possible results, design the activities to reach the results, select indicators and collect data. Readers should not be put off by the fact that this discussion is framed within the context of developing a Logical Framework – because the questions and processes outlined in this document are relevant whether we are using the LFA or a Logic Model, or any other framework to help us clarify results. This handbook includes an appendix with an example of different steps for a hypothetical project, on pages 91-101. Although it is longer, this handbook reminds me somewhat of SIDA’s The Logical Framework Approach: A Summary of the Theory Behind the LFA method, which I reviewed earlier. Overall, however I think the University of Wolverhampton’s Introduction to Multi-Agency Planning using the Logical Framework Approach, remains the most user-friendly of the LFA guides. Each short section lists questions which can be asked on these issues of sustainability at the preparatory stage of project design, during project implementation, during monitoring and evaluation, and after the project ends. Again, nothing startling here, but this document does put the major questions related to sustainability in 7 important areas, together in one document, and might be of assistance to someone drafting terms of reference for monitors, planners or evaluators. There are, however, more detailed handbooks available under the document search section (see discussion below). The second choice under “tools and publications” is Publications on Norwegian Development Aid. This is a collection of discussion papers, internal reviews, independent evaluations, and reports from partners, of interest to those who may want more detail on how the individual projects Norad funds, are working. 22 Norad action plans (although these seem to have been ended in 2009). 47 Norad annual reports, 26 of which are in English. Some of these, such as the Evaluation of Norwegian Development Cooperation Lessons Learned in 2011 do not appear under the evaluation category, and they have some interesting, and sometimes critical observations on issues of potential interest to many aid agencies, such as problems funding projects through multilateral agencies. 9 Norad handbooks - of use primarily to aid agency managers, but some, like the Handbook in Assessment of Institutional Sustainability, have some useful checklists which could be used by anybody. 22 Norad fact sheets of 2-4 pages in length, some in English, some in Norwegian, and many in both languages. 166 "Norad Reports" which include some evaluations of country programmes, some policy papers, and lessons learned documents. 32 Norad strategy papers, 13 in English. 606 Reviews from Norad partner organizations - a valuable resource for development professionals interested in how potential partners work. The 9 Norad Guidelines for Quality Assurance three of which I reviewed here earlier in this post. There are, interestingly, no documents listed under the search category "results reports" but there are clearly a number of documents in the other categories that deal with results. If the lists above prove daunting, the search function allows readers to specify subsets, by country, by one of 31 programme themes, by year, or type of document. Thus, a search which started with well over a thousand possible documents, could be narrowed down, into a workable number. This is a useful interactive tool allowing users to find Norwegian assistance not just by geographic distribution, but also sorted geographically by sector (Good governance, economic development and trade, education, health and social services, environment and energy, emergency assistance, multilateral, and by something called “donor costs”. Readers can also sort the programmes by partner type - NGO's in Norway, in other countries, multilateral agencies, public agencies, private agencies and public-private partnerships. Sectors are also disaggregated, so, for example, readers can see not only in which countries Norway provided assistance on education, for example, but, for example, to which countries Norad provided aid on basic education, in 2010-2011 - and if desired, through the partner type. The document search function and interactive data presentations on Norwegian aid are both worth looking at. The interactive aid map shows more imagination in the presentation of data than many donor agencies display, and together with the documents on the site, may help those interested in learning more about opportunities to work with Norad, or to collaborate with it on multi-donor projects, to find specific countries in which specific sectors are targeted by Norwegian assistance. In terms of results based management, however most of the documents on file here will be useful primarily as summaries of Norad policies, and with one exception, not practical guides for field workers or project managers.